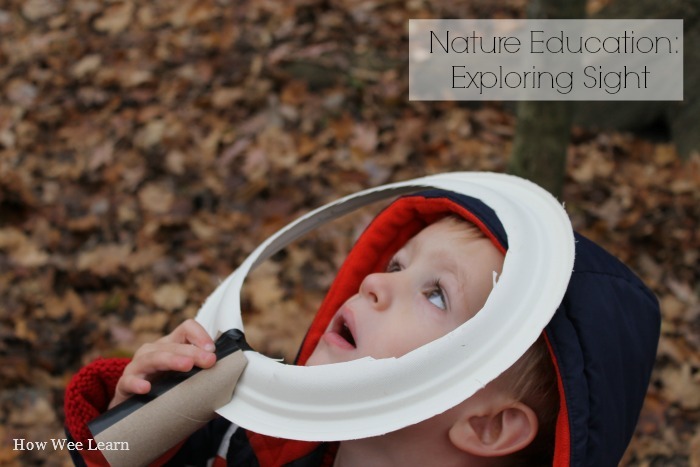 Exploring the sense of sight is a wonderful activity to do during a nature walk. There is so much to see! Whether you are exploring in a forest, a neighbourhood, or in the city there is so much to focus wee ones sight on. 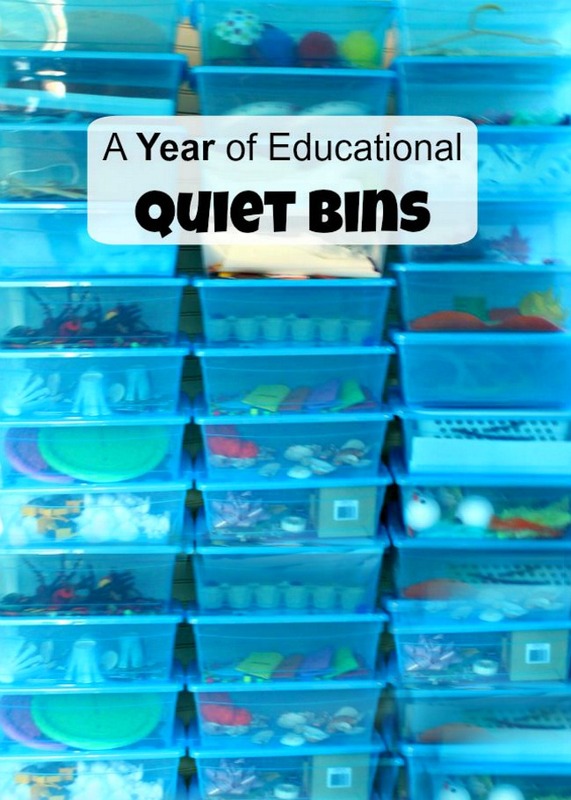 This is part 2 of our series on Exploring the Five Senses. Here is Part 1: Exploring Sound, if you missed it! To explore the sense of sight during our nature walk we made these cute “noticers” as they were called. Simply a paper plate with the middle cut out. Sammy added a toilet paper roll to the bottom of his with some tape for a handle. These little noticers were perfect to focus my wee explorers on using their sense of sight. We began our nature walk by walking around the forest with our noticers. The kids looked high and low, at things up close and far away. 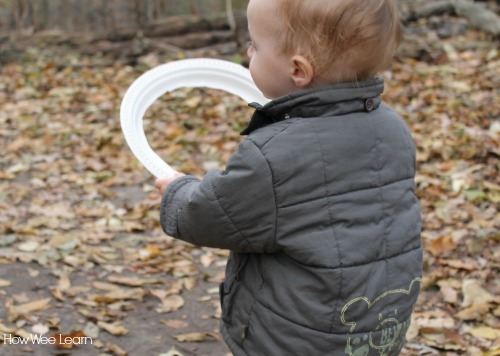 These simple paper plates were a perfect way to have my wee ones focus on using the sense of sight. It didn’t take long before something caught Sammy’s attention and we were off to have a closer look. As I wrote about last week (as a guest post on My Nearest and Dearest), Sammy has been loving moss lately. It wasn’t a surprise when this was the first thing he spied through his noticer and ran to get an up close look. 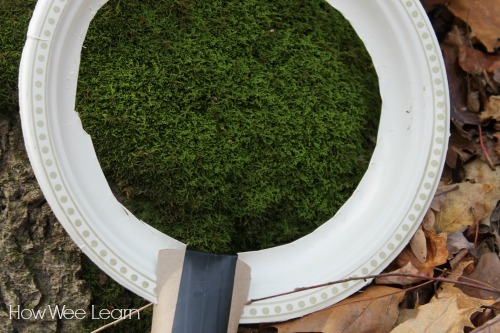 Using the paper plate as a frame was a nice way to look at an item in nature. Our woods is so big, with so much to see! By looking at a tiny little bit at a time my wee ones were really able to concentrate on the sense of sight. We talked a lot about what they saw, developing language that is so important. But I also let them have quiet time simply looking. Children have an amazing understanding of language, but the amount of language they can actually express is much less. This is why it is important I let my little explorers make their own observations – to themselves – sometimes. Of course not to be left out of the fun, Benjamin had a noticer and took his exploration very seriously. Exploring every little thing that his big brother did. As we were walking around and noticing every little thing and learning about the sense of sight, we saw some little animals. Since it is late Fall (well, we lovingly call it ‘Finter’ because we have many snowy days) the animals were very busy! Chipmunks would let us get quite close before scurrying into their holes. We got so close to one that we saw it run right down it’s hole. So of course, we had to get a closer look! Looking at the chipmunk hole that closely was very interesting. 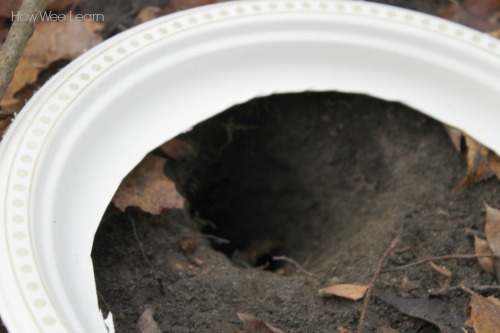 We could see quite a ways into the hole, and noticed how the soil was damper deeper in the hole. Sammy also noticed how big the hole was compared to the little chipmunk. It must have been a lot of work building that home! This sight activity was wonderful for developing language. It was neat hearing Sammy use the words he knew from his past experience with exploring trees with all of his senses. He used words like rough, smooth, hard, fine, bumpy, and deep grooves all by only looking at the tree. He was so very into this exploration of sight he didn’t even touch the trees with his hands at all! Exploring the five senses is a simple way for children to learn about how capable their wee bodies are. It also lets us explore things in much more detail and really learn about something so much more completely. 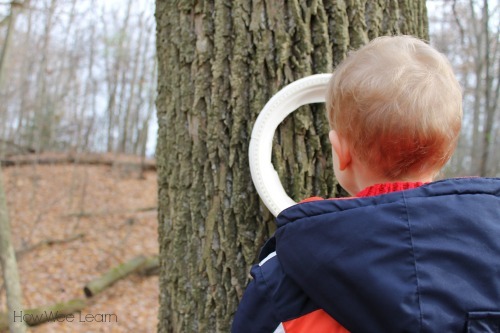 This activity, a nature walk with a paper plate noticer, really helped my wee ones explore and learn all about their sense of sight. It never ceases to amaze me how meaningful these simple activities can be. 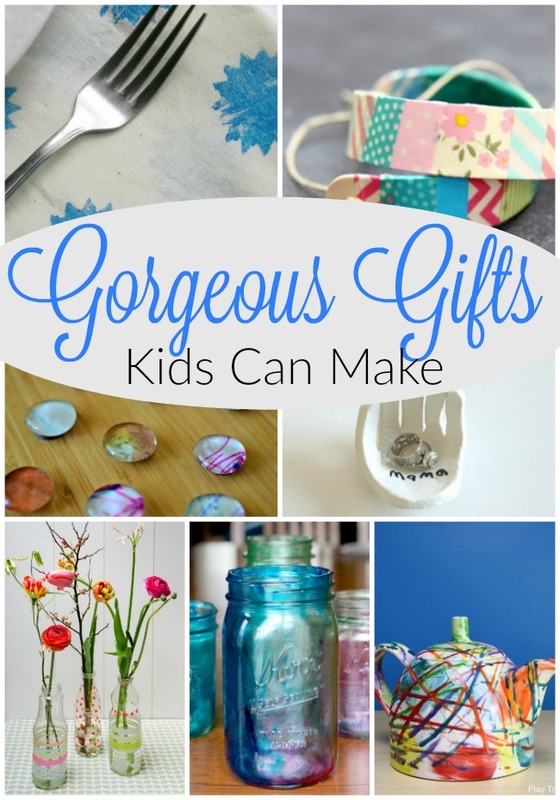 Please consider liking us on Facebook so we can share more creative learning activities with you and your wee ones! So glad you are joining us Donna – and I love it!! 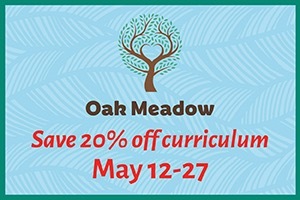 It is a wonderful outlet for me to still teach and help others – while I am also being home with my wee ones. Win-win! Loving this series, Sarah! We will have to make some noticers. My son and our pals would really have fun with them. Thank you so much Deirdre!